Combining the efficiency of electricity with the convenience of gas without sacrificing style. 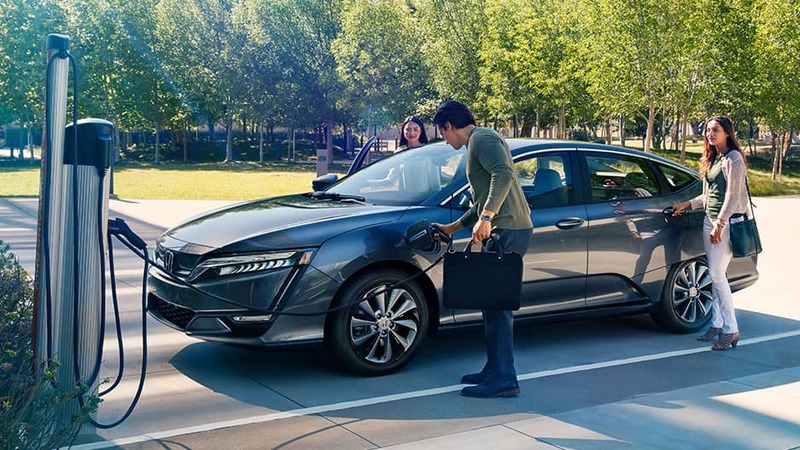 The new Honda Clarity Plug-In Hybrid combines the efficiency of electricity with the convenience of gas without sacrificing style. The future is clear in the new Honda Clarity Plug-In Hybrid, the innovative hybrid that offers enhanced efficiency, eye-catching style, and a fun ride. By combining an electric motor with a VTEC® gas-powered engine, the new Clarity Plug-In Hybrid offers a combined driving range of 340-miles. The electric motor allows you to travel up to 47 miles on electricity only, so you can commute to work or run your errands without using gas. Once you deplete the electric charge, it will switch to the hybrid mode for uninterrupted driving performance. Whether you’re commuting to work in Irondequoit, shopping in Fairport, or meeting friends in Webster, the new Honda Clarity Plug-In Hybrid ensures you get the most bang for your buck. The new Honda Clarity Plug-In Hybrid is by no means boring. 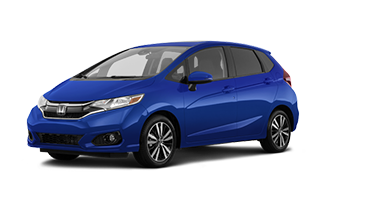 Honda designed this sleek hybrid to be as aerodynamic as possible without sacrificing its premium styling. The body features front and rear ducts that guide air around the tires, a covered underbody, and rear tire covers integrated into the Clarity Plug-In Hybrid’s sculpted body. These are just some ways Honda designed this hybrid with both style and efficiency in mind. Experience the new Honda Clarity Plug-In Hybrid for yourself today with a test drive at Garber Honda in Rochester. Honda designed the new Clarity Plug-In Hybrid to be both stylish and aerodynamically efficient. This hybrid boasts a streamlined design, strategic air ducts, and LED lighting for an eye-catching ride. Honda designed the new Clarity Plug-In Hybrid with a modern vision in mind. This hybrid is composed of sharp, sleek lines, aerodynamic curves, and a unique headlight design. To complete the look, there’s chrome door trim and streamlined body-side molding for extra style. Illuminate the road ahead with the Honda Clarity Plug-In Hybrid’s LED headlights that cast light farther than traditional bulbs. The Clarity Plug-In Hybrid also features LED Daytime Running Lights and LED taillights, so you’re visible from every angle. Every angle of the new Honda Clarity Plug-In Hybrid helps air flow more efficiently around the vehicle. It has air ducts in the front and rear to guide air around the tires, a covered underbody, and a rear tire cover that all work together to ensure optimum aerodynamics. 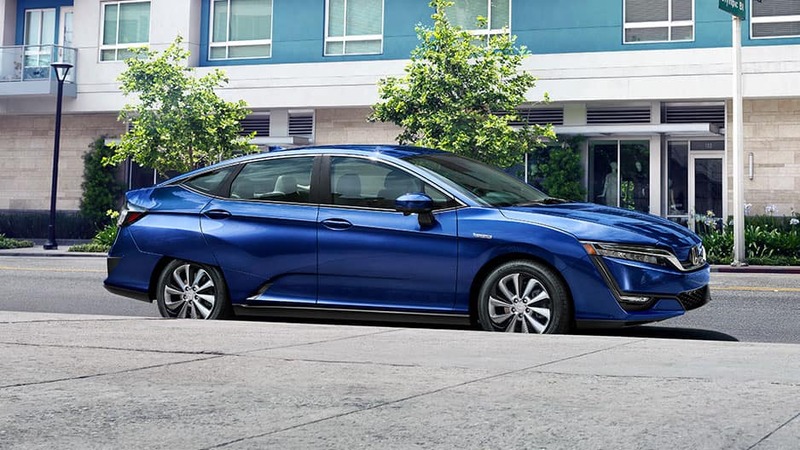 The new Honda Clarity Plug-in Hybrid’s curb appeal is undeniable with a set of angular, five-spoke 18-inch wheels that enhance this hybrid’s standout beauty. Whether you’re cruising through town or headed out on your next road trip, the new Honda Clarity Plug-In Hybrid will turn heads with one of six stunning colors, including Crimson Pearl, Moonlit Forest Pearl, and Modern Steel Metallic. Honda also designed the new Honda Clarity Plug-In Hybrid with your comfort in mind. 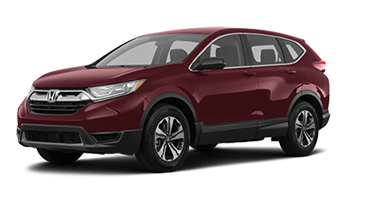 Whether you’re traveling cross country or handling errands around town, this hybrid offers an enjoyable ride with dual-zone climate control, heated front seats, and contemporary styling. Honda designed the new Clarity Plug-In Hybrid’s interior to be just as eye-catching as the exterior. Slip behind the multifunction steering wheel and luxuriate in the leather-trimmed seats and steering wheel, streamlined dashboard, and innovative push-button gear shift. With the Honda Clarity Plug-In Hybrid’s dual-zone automatic climate control, you and your front passenger can choose individual temperature settings, ending arguments over whether it’s too hot or too cold. Your morning commute is about to get better with the Honda Clarity Plug-In Hybrid’s available heated front seats. With the press of a button, the seatback and cushion heat up to surround you in comfort. With the Honda Clarity Plug-In Hybrid’s HondaLink® mobile app, you can take advantage of Remote Climate Pre-Conditioning to pre-set and control the temperature before you even get in, so you’re ready for whatever Mother Nature throws your way. The new Honda Clarity Plug-In Hybrid is equipped with smart entry with walk-away auto lock. As long as you have the access key somewhere on you, you can open the doors and start the engine with the push of a button. The access key can also detect when you’ve walked away from the vehicle and will lock the doors for you automatically. Wherever the road takes you, you can rely on the new Honda Clarity Plug-In Hybrid to keep you connected. 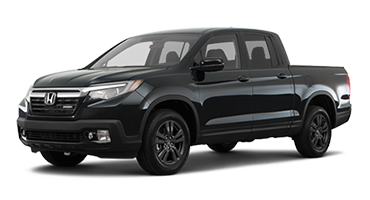 This state-of-the-art hybrid offers the advanced technology features you crave, such as smartphone integration, navigation, and the HondaLink® app. Honda made it easy to stay connected on the go in the new Clarity Plug-In Hybrid with smartphone integration. Sync your device via Apple CarPlay™, Android Auto™, or Bluetooth® and enjoy your favorite phone functions right from the 8-inch HD touchscreen. 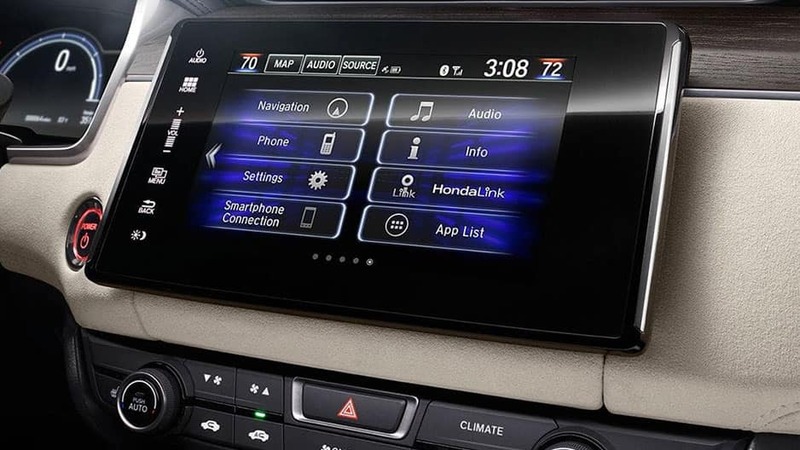 With the easy-to-use HondaLink App, you can control certain vehicle functions right from your smartphone. Download the app and view the Clarity Plug-In Hybrid’s estimated driving range, check battery charge status, and set the cabin temperature with Remote Climate Pre-Conditioning. 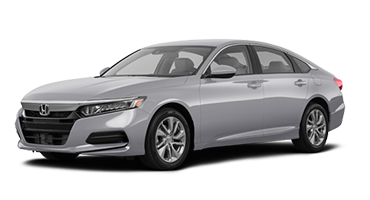 The new Honda Clarity Plug-In Hybrid offers an available Honda Satellite-Linked Navigation System™ that provides turn-by-turn navigation, 3D mapping, lane guidance, and even a live search function. Tired of the same old playlists? 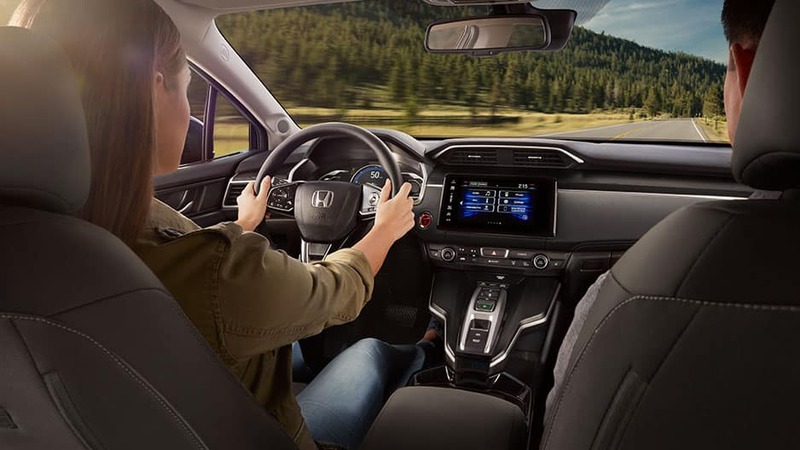 The new Honda Clarity Plug-In Hybrid comes with a free six-month trial of SiriusXM Satellite Radio, so you’ll have over 150 channels of commercial-free music, live sports, talk, entertainment, and so much more to choose from. The new Honda Clarity Plug-In Hybrid is equipped with a 180-watt audio system with eight speakers so you can pump up the volume on your next road trip. When it comes to the safety of you and your loved ones, the new Honda Clarity Plug-In Hybrid leaves nothing to chance. 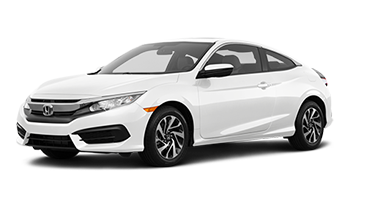 That’s why this hybrid comes with standard Honda Sensing® — a suite of advanced safety and driver-assistive technologies to ensure your safety. With the Collision Mitigation Braking System, the new Honda Clarity Plug-In Hybrid can detect when a front end collision is imminent and activate the brakes to lessen the impact or avoid the collision altogether. 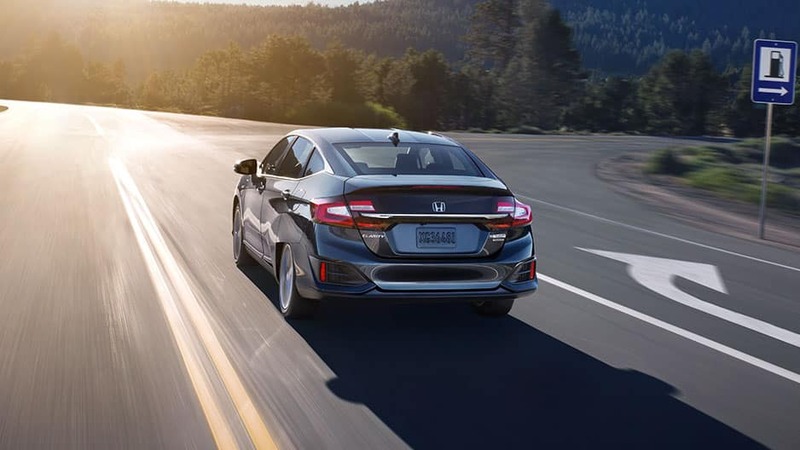 Using a small camera, the Road Departure Mitigation system detects when the Honda Clarity Plug-In Hybrid is about to leave the road and alerts you while also using steering wheel torque to help you remain in your lane. With adaptive cruise control, you choose the Honda Clarity Plug-In Hybrid’s cruising speed and following distance from the vehicle ahead. If you approach a slower vehicle, the system automatically slows you down to maintain that distance. Once the system no longer detects a vehicle ahead of you, it accelerates back to the original cruising speed. The Lane Keeping Assist System detects when the Honda Clarity Plug-In Hybrid drifts out of its lane unintentionally without signalling and uses gentle steering wheel tugs to get you back on track. Using a camera mounted to the bottom of the passenger side-view mirror, Honda LaneWatch provides a live video of the passenger-side of the road when you activate the blinker. This reveals nearly four times more than a traditional mirror. Enjoy the best of both worlds in the new Honda Clarity Plug-In Hybrid that combines an all electric motor with a gas-powered engine. You’ll be spending less time at the pump and more time on the open road. The new Honda Clarity Plug-In Hybrid is equipped with an electric motor that delivers a 47-mile all-electric driving range, so you can commute around town without using your gas. On longer trips, the new Honda Clarity Plug-In Hybrid uses a VTEC® engine that delivers 181 horsepower and 232 pound-feet of torque. Once the Clarity Plug-In Hybrid uses up its electric charge, it will seamlessly switch to the gas-powered engine for an uninterrupted driving experience, boasting a combined driving range of 340 miles. The new Honda Clarity Plug-In Hybrid offers four dynamic driving modes — Normal, ECON, Sport, and HV Mode — that lets you choose how you use the power. Select the HV Mode and the Clarity Plug-In Hybrid will optimize charging and regenerate up to 50% of the electric range. Honda makes it easy to charge the new Clarity Plug-In Hybrid’s electric motor. You can recharge this hybrid at home in 2.5 hours with a 240-volt charger or in 12 hours with a 120-volt outlet. You can also charge up at ChargePoint and EVgo stations. Wherever the road takes you, you can rely on the new Honda Clarity Plug-In Hybrid to have your back. 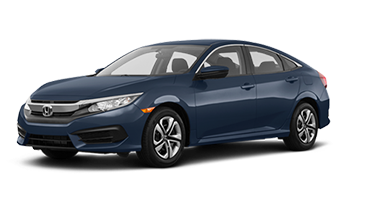 Whether you’re using your electric miles to commute to work or the gas engine for long road trips, this hybrid gives you peace of mind with the standard Honda Sensing® suite of advanced safety features keeping you and your precious cargo safe. There’s even the Honda LaneWatch™ camera that shows up to four times more than the passenger side-view mirror, so you can navigate traffic safely. The new Honda Clarity Plug-In Hybrid doesn’t skimp on advanced technology. Sync your smartphone to the infotainment system to use hands-free calling or music streaming, while using the Honda Satellite-Linked Navigation to help you find your way home. Pump up the volume and say goodbye to boring road trips. All this and more is waiting for you in the new Honda Clarity Plug-In Hybrid. 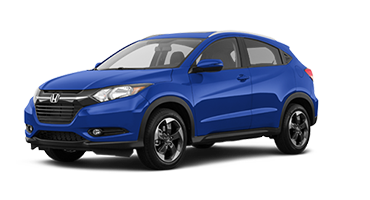 Schedule your test drive today with Garber Honda in Rochester. 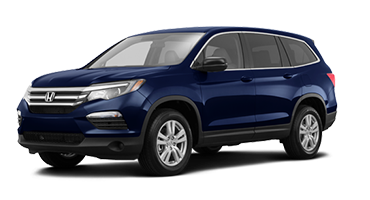 *MSRP excluding tax, license, registration, $895.00 destination charge and options. Dealers set own prices. MSRP is for 2018 Honda Clarity Plug-In Hybrid. 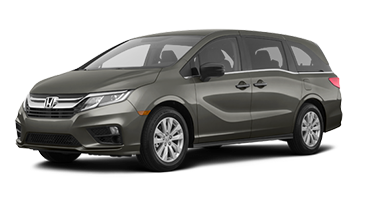 *Fuel Efficiency: 110 combined miles per gallon of gasoline-equivalent (MPGe) electric rating; 44 city/40 highway/42 combined MPG gasoline only rating. 47-mile maximum EV mode driving range rating. 340-mile combined gas-electric driving range rating. Ratings determined by EPA. Use for comparison purposes only. Your MPGe/MPG and driving range will vary depending on driving conditions, how you drive and maintain your vehicle, battery-pack age/condition and other factors.